We understand that you will have questions about our policies and procedures. To help you out, we’ve put together a list of the most frequently asked questions so you can get the answers you need 24-7. Of course, if you are unable to find the information you need on our website, please do not hesitate to contact us. Do you provide infant and toddler childcare? My child suffers from a peanut allergy. What is your policy? Does Grace Lutheran offer a before and after school care program? What is the dress code at Grace Lutheran? Where can I purchase clothing with the Grace Lutheran logo? May my child carry and use a cell phone on campus? My child needs to leave school early. What is the procedure to check out of school? My child will miss school. What do you consider an excused absence, and what is the procedure for reporting an absence? How late can my child arrive at school before he/she is considered tardy? My child must take medication during school hours. What is the procedure to set this up? In the event of inclement weather or tornado watches, how will we know if the school is closed? We would prefer to have our middle school child bring and use his/her own laptop computer in lieu of renting a Chromebook. What is the policy? Yes! Our Child Development Center provides loving care in a Christ-centered learning environment for children ages six weeks to four years old. Our hours are 7:00 a.m. – 5:30 p.m. Please visit our Child Development Center page for more information. Yes, we do have an all-day kindergarten program as well as a half-day kindergarten option. Please visit our Prekindergarten-5th Grade page for more information. Yes, we do offer a hot lunch program. Our hot lunch program provides made-from-scratch, healthy food choices that meet or exceed federal and state guidelines for fit and healthy students. We will provide you with a monthly lunch menu via email, or we will send one home in the parent communication packet. We require parents to order lunches of their choice online through RenWeb. Money should be placed in a prepaid account, which will be drawn from as used. We provide milk or another drink with the complete lunches. There is also an a la carte option of salads and sandwiches, which may be made into a complete lunch. These do not need to be ordered in advance and will be charged to the same account as the hot lunches. Students in prekindergarten through 3rd grade have a snack break each morning. Milk may be ordered on a yearly basis for a fee. We do not claim to be completely peanut or nut free due to community use of our facilities; however, we do not serve any food products made with peanuts or nuts to our students. This restriction includes food items such as peanut butter, trail mixes, or candies made with nuts. Our cafeteria does not use peanut oil or nuts in food preparation for after-school snacks or for snacks sold at the snack store by the student council. For more information, please read about our peanut-free policy in our Parent and Student Handbook located in the Parent Resources quick link category found on the Home page. Our regular school day hours for grades PK-11 are from 8:00 a.m. to 3:05 p.m. Please visit the This is Grace Lutheran web page for more specifics regarding our extended care and other program hours. Early morning care from 7:00-7:30 a.m.
After school care from 3:05-5:30 p.m. Please visit our Activities and Extended Care page for more information. We believe that the dress and appearance of students is an important key in the overall atmosphere of the school. A student’s appearance reflects respect for their teachers and peers; therefore, all clothing worn must be neat, clean, and presentable. Please review our dress code policy located in the Parent Resources quick link category found on the Home page. Educational Outfitters, 97 Hughes Road, Madison. Call 464.6151 for more information. Lands’ End online store. Our Preferred Customer Number is 900127366. You may purchase standard and plain clothing such as slacks, shirts, and skirts without logos from a variety of retailers, including JC Penney, Target, Sears, K-Mart, Walmart, and Belk. We recognize that today’s society is reliant on our cell phones and Internet connections. Our students are no different. We expect our students to handle their electronic communication in a manner that will “make the Good Lord smile.” We are responsible for our words and actions whether we type, text, or say them aloud for others to hear. We do not permit students to use their cell phones during the school day, including before and after school care hours. We will confiscate phones to the custody of the principal. Our principal will only return a phone directly to a student’s parents; if you would like the principal to keep the phone, he is happy to! We require parents to report first to the office and sign their child out when they wish to pick him/her up during the school day. Regular school attendance is an important key to your child’s success at school. We will consider the absence “excused” if your child misses school due to illness, a death in the family, medical/dental appointments, pre-excused absences for vacation, or special family events. In the event your child is home ill, we require parents to call the school office no later than 9:00 a.m. to inform us. Upon return, we require a written statement explaining the reason for the absence. We require a doctor’s note for students who miss more than three consecutive days of school due to illness. We expect students to make-up missed work; generally, our teachers allow one day to complete work for each day of absence. We lock the outside doors to both buildings promptly at 8:00 a.m. We require the parents of students arriving late to bring the child to the office to sign in and receive a signed pass to class. We will mark students in prekindergarten through 11th grade tardy if they are not in their classrooms when the tardy bell rings at 8:00 a.m.
Students in 5th – 11th grades change classes throughout the day. We expect our middle and high school students to take care of restroom, locker, and social needs between classes and be seated and ready to go when the class tardy bell rings. We do not permit students to bring non-prescription or prescription drugs to school. If your child requires medication during the school day, a parent or guardian must bring the medication to the school office and complete the Medicine Authorization form. We will administer medications according to a doctor or parent’s written directions. We will administer medication in the school office for children in grades PK-11. Typically, Grace Lutheran will close when schools in the Huntsville City system close due to ice and/or snow. We will notify you of closures through our Parents Alert system or via local media; there is no need to call the school or the teacher. In the event inclement weather conditions force us to close when school is in session, we will not allow the students to leave the building until a parent or a designated adult comes to the school to pick up the child. For the safety of our students and staff, please pick your child up as soon as possible. In the event of a tornado watch, our school administration will notify the staff and closely monitor the weather service radio and local television broadcasts. Our staff and students will follow established emergency procedures requiring evacuation to protected areas in the centers of the buildings where we will remain until the national weather service officially lifts the warning. For the safety of all, we strongly urge parents to leave their children at school during these watches and warnings. We follow a specific protocol with respect to our drop-off and pick-up procedures. Please refer to the Drop-Off and Pick-Up Procedures provided in the Parent Resources quick link category found on the Home page. We have found that renting the Chromebooks to students is easier all around for parents, students, teachers, and our tech support. As such, we will not make exceptions to our rental policy. 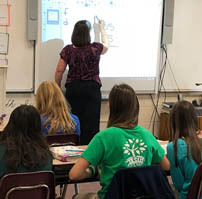 Our teachers instruct more effectively when all of our students and teachers work with the same model computer, and our tech department can more effectively support the school model. We have found that “out-of-program” laptops require an inordinate amount of time and effort to support; this often results in the student being without his/her laptop longer if needs a repair.